Tall Svend Bayer jar - 12½" (317 mm) high. Strong words from Cardew, considering that music played a more important part in his life than pottery, and that he considered Mozart the supreme composer. Svend Bayer is best known for his large garden pots, but also makes domestic wares. He uses a wood-fired, cross-draught, single-chamber 800 cu.ft. kiln, and is based in Sheepwash, Devon. He was born of Swedish parents in Uganda in 1946, and came to England when he was sixteen. He studied at Exeter University from 1965 to 1968 and started working with Michael Cardew at Wenford Bridge in 1969. In 1972 he joined the Brannam Pottery where he worked as a thrower for a year. After travelling in the Far East, Asia and the U.S.A., he set up his workshop in Devon. His work is sometimes plain, sometimes boldly decorated, often with large bird designs. Svend is a member of the Gnarly Dudes group who exhibit annually at Powdermills Pottery in Dartmoor. The Gnarly Dudes are five independent potters who share an interest in anagama firing. 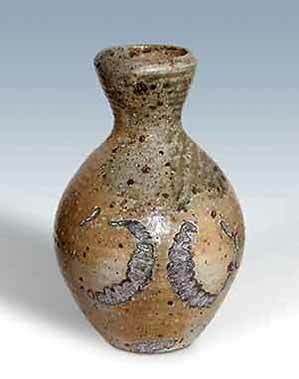 Svend Bayer, Charles Bound, Nic Collins, Jon Fellows, Chuck Schwartz got together in 1997 to stage an exhibition of their anagama-fired work at Nic's Powdermills Pottery on Dartmoor in Devon. A brief description of anagama firing is necessary: An anagama kiln is wood-fired and based on the medieval Japanese kilns used at Bizen and Shigarki. 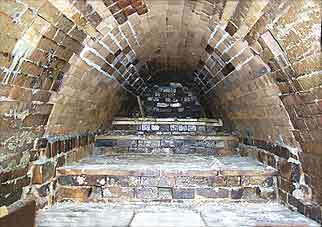 The kiln is a tunnel, usually built on a bank, rising from the front to the back. The chimney is at the back and the fire is at the front. The heat is drawn over the stacked pots, allowing smoke, ash and embers to freely come into contact with them. The pots themselves are not decorated prior to firing; the smoke, ash and embers interact with the clay to produce the beautiful gradations of colour and finish. Placement of the pots in the kiln is critical, as is the selection of wood and clay. Recent research by Svend has shown that it is not essential for the chamber of the kiln to slope upwards towards the chimney, so long as the height of the chimney opening forms the correct angle with the fire. The Gnarly Dudes exhibition is now an established annual event, and since Nic has moved to new premises in nearby Newton Abbot the show is now organised at Powdermill by Joss Hibbs who pots there. The gallery is a stone barn, originally used for making gunpowder.